Balance engineers develop dam inundation maps for a variety of client needs, of late these efforts have been focused on SB 92, signed into law on June 27, 2017 by Governor Brown. SB 92 set forth new requirements focused on dam safety, as part of this legislation, dam owners must now submit inundation maps to Division of Safety of Dams (DSOD). 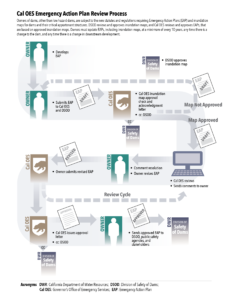 After the maps are approved, the dam owner must submit an emergency action plan to Cal OES. The owner must submit updated plans and inundation maps every 10 years, or sooner under certain conditions. Cal OES will review and approve the emergency action plans. This legislation set forth additional provisions for emergency action plans including compliance requirements, exercises of the plan, and coordination with local public safety agencies. Under the new law, an Inundation Map must be created and submitted for review and approval by DWR/DSOD. 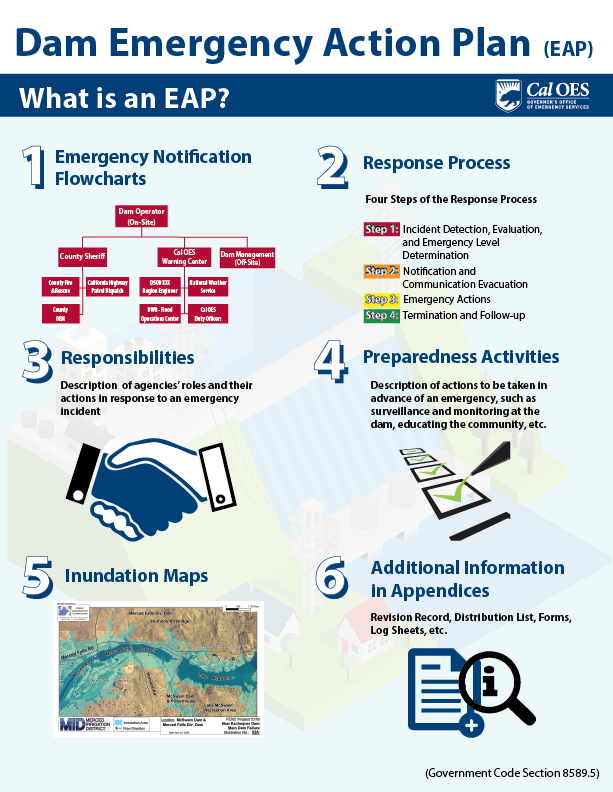 Although DWR/DSOD will be responsible for reviewing and approving the Inundation Maps, the California Office of Emergency Services (Cal OES) will oversee and approve the EAPs. The DSOD updated the hazard classification for all dams under State jurisdiction with respect to safety. This classification is based solely on downstream hazard considerations, not the actual condition of the dam or its critical appurtenant structures. Dams categorized Significant, High, and Extremely High are required to prepare dam inundation maps and Emergency Action Plans. 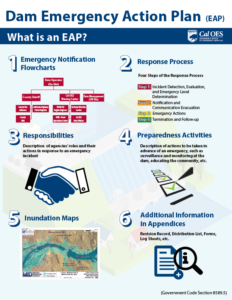 Tables 1 and 2 summarize the hazard classification and due dates for Inundation Maps and EAPs. Table 2. Inundation Map and EAP due dates. For assistance with Dam Inundation Mapping and Emergency Action Plans, please reach out to Colleen Haraden, charaden@balancehydro.com. 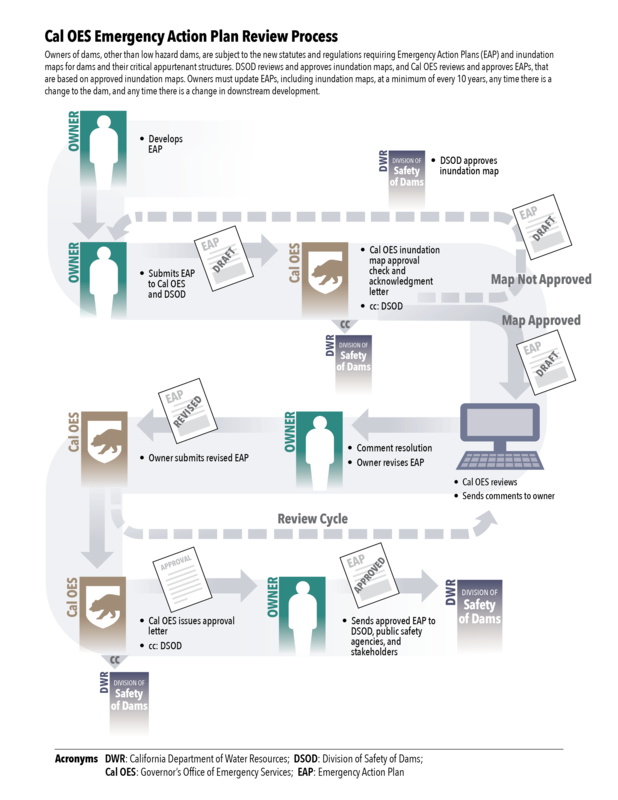 The images to the right, from the CalOES website, summarize the workflow for developing the EAP source: http://www.caloes.ca.gov/cal-oes-divisions/hazard-mitigation/dam-emergency-action-planning.